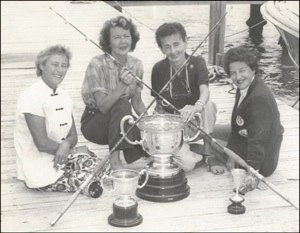 The International Women’s Fishing Association was organized as a result of a long discussion among the lady anglers during the International Light Tackle Tournament (ILLTA) in Palm Beach, FL, 1955. For years many of the wives had been coming to the tournaments from far away places like California and Texas. Their only chance to fish was on “Ladies Day,” only if their husbands were assured of three good days of fishing for themselves. The more they discussed it, the more determined they became to do something about it. After the season was over, three of the women did. Mrs. “Denny” Crowninshield, Mrs. John “Kay” Rybovich, and Mrs. Thomas T “Ginny" Sherwood. With much prodding from Kay, the trio recruited another ardent fishing woman. Mrs. Jacqueline Gerli, and by the middle of March the IWFA was on its way! The original foursome telephoned their friends, and two weeks later, with16 members present, they proudly held their first IWFA meeting. 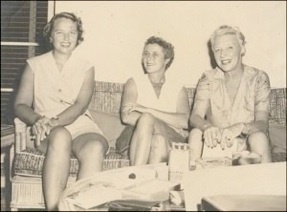 By June of 1955, 100 women had joined and in December of that year the first IWFA Annual Sailfish Tournament was held.In 1957, a special occasion came inthe form of an invitation for the IWFA to field a team in the Hemingway Marlin Tournament in Havana, Cuba. The invitation had been extended to Denny, and with only a few hours to get the team together, the three founders of the IWFA, Denny, Kay, and Ginny, dropped everything and flew to Cuba! To the best of anyone’s knowledge, this was the first women’s team ever to compete against men in a fishing tournament. The IWFA made headlines when they brought the championship trophy home! Always interested in conservation and education, in 1966 the members of the IWFA established a scholarship trust to aid qualified students seeking advanced degrees in the field of Marine Sciences. To date over 150 scholarships have been awarded. The IWFA is proud to be the recipient of both the IGFA’s and The Billfish Foundation’s Conservation Awards. Ongoing IWFA programs continue to encourage women’s fishing while funding scholarships and promoting conservation. Today’s membership includes women anglers from around the world. IWFA members have tested the fishing grounds from Florida to Alaska, and Australia to Chile.